New research from Broad scientists lends new understanding to Lassa virus, which kills at least 5,000 people every year. 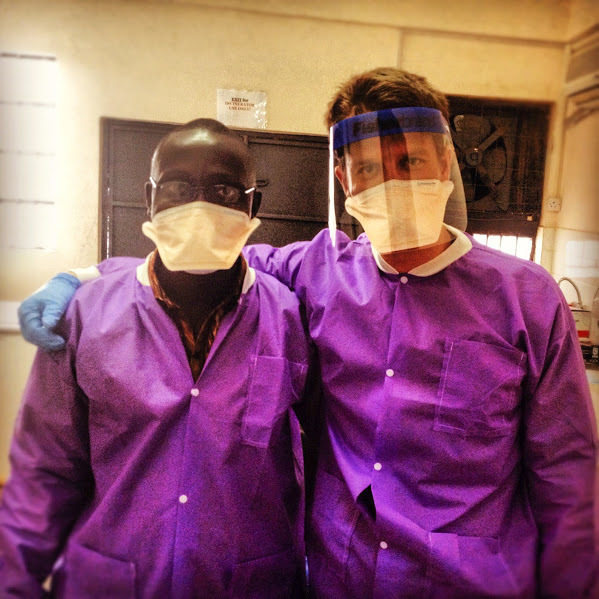 Pictured are Pardis Sabeti and Edwin Konuwa of the Kenema Government Hospital.Photo courtesy of the Sabeti Lab. Between 2013 and 2015, an outbreak of Ebola virus killed more than 11,000 people. Broad Institute researchers quickly deployed real-time sequencing efforts that confirmed that the virus was primarily spreading through human-to-human contact rather than between animals and humans and that the viral genome was mutating. This work had a profound impact on how public health officials diagnosed the disease and developed strategies to contain it. That research was feasible largely because institute member Pardis Sabeti and her team had already been working on another deadly virus affecting West Africa: Lassa virus. In 2007, the Sabeti lab discovered genetic evidence that humans might be able to develop resistance to Lassa. They quickly set up a field site in Nigeria at the Irrua Specialist Teaching Hospital and formed collaborations with researchers from Tulane University working in Sierra Leone. Since then, the group has been sequencing the genomes of Lassa viral content in human blood samples. Those data now collectively form the largest catalog of information to date on Lassa Virus (LASV) available in the world. They were published this week, along with the team’s analyses, in the August issue of the journal Cell. Like Ebola, Lassa is a fatal, hemorrhagic fever virus. It kills at least 5,000 people each year, most of whom live in Sierra Leone, Nigeria, Liberia, and Guinea. Despite its impact, little research had been done on the virus until 2009. The same was true of Ebola before the recent outbreak. “Lassa and Ebola are not only potential global threats, but have likely been circulating in communities for many years,” said Sabeti. “It is a greatly overlooked public health challenge but also an opportunity to set up capacity to diagnose, treat and research these viruses now, before the next major outbreak.””Because of the potential for such large and severe outbreaks, it’s important that we perform research that allows us to better understand how these viruses transmit, how they evolve, how long they’ve been with us—we need to answer very fundamental questions and sequencing can help us address some of them,” said Kristian Andersen, one of three co-first authors on the new Cell paper. Andersen—now an assistant professor at the Scripps Research Institute in La Jolla, California—led the Lassa work while a post-doctoral researcher in Sabeti’s lab. Andersen and his colleagues sequenced 196 LASV genomes, including 11 collected from the rodent species that serves as the virus’ natural reservoir. The data allowed them to confirm that, in contrast to Ebola, Lassa patients typically contract the disease through individual “spillover” events from the animal to human population—that is, the virus is rarely transmitted between human patients. “Lassa is probably less transmissible than Ebola—either from rodent to human, or from human to human,” Andersen explained. “Presumably, however, since many rodents are infected and live in households, there may be more ‘opportunities’ for transmission from rodent to human to occur.” This means that strategies for containing Lassa could be fundamentally different from those used to contain Ebola and would focus more on the rodent reservoir population rather than minimizing human-to-human contact. The team also examined the diversity of viral species infecting humans and rodents and found much more diversity among the latter. Because the rodents can be infected without becoming ill or dying, they are considered chronic carriers in whom there is more opportunity for the virus to mutate and evolve. Surprisingly, the researchers also saw a few human samples containing more diverse viral strains than normal, suggesting that some people might be infected for longer than previously thought. Andersen and his team at Scripps, as well as researchers at Broad, Tulane, and Irrua are now launching an effort to sequence healthy individuals across West Africa to determine whether the virus is present as a chronic, symptom-free infection in many more people than are typically diagnosed. “We’re also looking at how many people have antibodies to these viruses—both to Ebola and Lassa,” Andersen said, explaining that antibodies are developed whenever an individual becomes infected, even if they don’t present any symptoms. The diversity findings may also point to an immune escape mechanism wherein the virus develops mutations that allow it to evade an infected host’s immune response. “We found that, of the within-host mutations that affect protein structure, a surprisingly high number fall in parts of a Lassa surface protein targeted by the human immune system,” said Jesse Shapiro, a co-first author based at the University of Montreal. “This could have implications for vaccine design because it might mean that the virus is able to evade vaccine-induced immunity.” But the team also found that these particular mutations are rarely passed from one host to another, suggesting that, while they do provide adaptive immune escape within the host, “they may be evolutionary dead-ends that are unfit to transmit,” Shapiro said. The team is now undertaking further research to follow up on the immune escape hypothesis. While the research is exciting from a scientific perspective, Andersen said, “People are dying every day.” He noted that work like this is critical to better understanding the disease in order to someday make a real difference for patients and their families. Other Broad Researchers: Aaron M. Berlin, Bruce Birren, James Bochicchio, Eleina M. England, Hilary K. Finucane, Michael Fitzgerald, Stephen K. Gire, Andreas Gnirke, Andrea Ireland, Eric Lander, Niall J. Lennon, Joshua Z. Levin, Aaron E. Lin, Christian B. Matranga, Caryn McCowan, Mahan Nekoui, Eric Phelan, Elizabeth M. Ryan, Stephen F. Schaffner, B. Jesse Shapiro, Rachel Sealfon, Matthew Stremlau, Shervin Tabrizi, Ridhi Tariyal, Barbara Tazon-Vega, Ryan Tewhey, Sarah Winnicki.